Line a 9x9 baking dish with parchment paper or grease very well. Set aside. Use a rubber spatula to gently mix in the puffed rice cereal. Mix until cereal is coated. Gently press the cereal mixture into the prepared baking dish. Don't press hard-- just enough to spread the cereal to the edges of the dish. (I use a greased rubber spatula to do this). 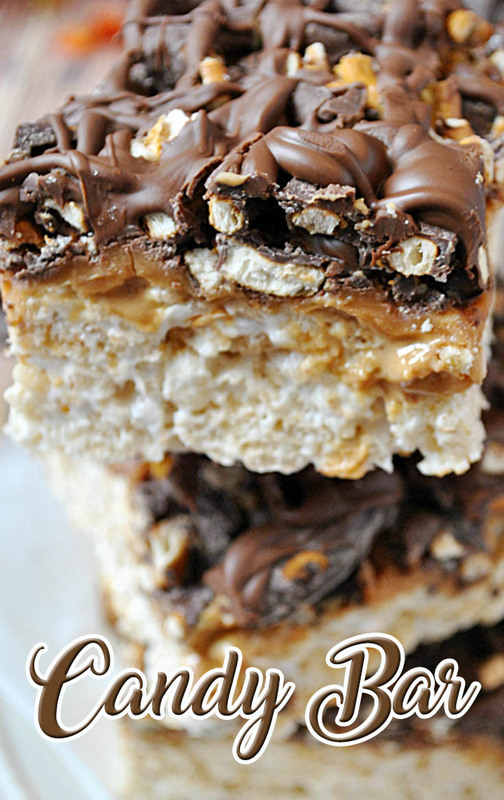 Spread the peanut butter over the krispie treats, and set aside. Place the caramel pieces in a small, microwave safe dish. Pour the cream or half & half or milk or water (the fattier liquids make the caramel creamier, but you don't have to use them) over the caramel. Microwave for 1 minute. Stir until smooth. Pour caramel over the peanut butter. Press the chocolate covered pretzel pieces into the caramel. Place the baking melts into a gallon sized zip top bag, unsealed, and microwave for 30-60 seconds until the chocolate has melted. Snip the corner of the bag, and drizzle the chocolate over the pretzels. Let cool at room temp for about 30 minutes to let chocolate harden, OR put it in the refrigerator or freezer to set up the chocolate in half the time! Cut into 2 inch squares to serve. Store in airtight container for up to a week.